4: “What man of you, having a hundred sheep, if he has lost one of them, does not leave the ninety–nine in the wilderness, and go after the one which is lost, until he finds it? 5: And when he has found it, he lays it on his shoulders, rejoicing. 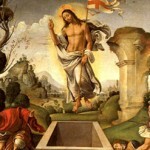 6: And when he comes home, he calls together his friends and his neighbours, saying to them, ‘Rejoice with me, for I have found my sheep which was lost.’ 7: Just so, I tell you, there will be more joy in heaven over one sinner who repents than over ninety–nine righteous persons who need no repentance. 11 And he said, “There was a man who had two sons; 12 and the younger of them said to his father, ‘Father, give me the share of property that falls to me.’ And he divided his living between them. 13 Not many days later, the younger son gathered all he had and took his journey into a far country, and there he squandered his property in loose living. 14 And when he had spent everything, a great famine arose in that country, and he began to be in want. 15 So he went and joined himself to one of the citizens of that country, who sent him into his fields to feed swine. 16 And he would gladly have fed on the pods that the swine ate; and no one gave him anything. 17 But when he came to himself he said, ‘How many of my father’s hired servants have bread enough and to spare, but I perish here with hunger! 18 I will arise and go to my father, and I will say to him, “Father, I have sinned against heaven and before you; 19 I am no longer worthy to be called your son; treat me as one of your hired servants.”‘ 20 And he arose and came to his father. But while he was yet at a distance, his father saw him and had compassion, and ran and embraced him and kissed him. 22 But the father said to his servants, ‘Bring quickly the best robe, and put it on him; and put a ring on his hand, and shoes on his feet; 23 and bring the fatted calf and kill it, and let us eat and make merry; 24 for this my son was dead, and is alive again; he was lost, and is found.’ And they began to make merry. This chapter contains three parables about the mercy of God towards sinners. The chapter is often referred to as the “Gospel within the Gospel”. The complete chapter forms the Gospel passage for Ordinary Time Sunday 24C. In Lent Sunday 4C, verses 4–10, the first and second of the three parables, are omitted. However, as they are not long but bring out the message, they are included here. “Now the tax collectors and sinners were all drawing near to hear him” — Chapter 14 ended with the words, “He who has ears to hear, let him hear” (Lk. 14: 35). Those words were a challenge for sinners and this chapter 15 opens with the tax collectors and sinners coming close to Jesus to hear his words. ‘Hearing’ is a sign in Luke of conversion (Lk. 5: 1, 15; 6: 17, 27, 47, 49; 7: 29; 8: 8–18; 9: 35; 10: 16, 24, 39; 11: 28, 31).Hearers are acknowledging their sinfulness and doing something about it. Jesus was very welcoming to the “tax collectors and sinners” because he came on earth for sinners (Lk. 5: 30; 7; 34), to save them. “And the Pharisees and the scribes murmured, saying, “This man receives sinners and eats with them” — “This man” is a contemptuous reference. Accepting sinners and eating with them is one of the main objections the Pharisees and scribes had against Jesus. In this way they showed that they rejected Jesus and expressed this by murmuring and complaining. “eats with them” — He treated them as friends, companions, sharing the same table. The word “companion” is composed of two Latin words (com–panis) which mean to share bread with. Speaking about John the Baptist in Chapter 7, Jesus praised him and the tax collectors were very pleased because they had been baptised by him. The Pharisees and scribes were not pleased because they had not accepted John’s baptism and God’s purpose for them — “(When they heard this all the people and the tax collectors justified God, having been baptized with the baptism of John; but the Pharisees and the lawyers rejected the purpose of God for themselves, not having been baptized by him. )” (Lk. 7: 29–30). “So he told them this parable” — These three parables are addressed to the Pharisees and scribes. Jesus will describe searching for and welcoming sinners (Lk. 15: 4–7; 8–10; 11–32). All three stress the initiative of the shepherd, the woman and the father. “having a hundred sheep, if he has lost one of them, does not leave the ninety–nine in the wilderness, and go after the one which is lost, until he finds it?” — The shepherd goes to great lengths and takes huge risks by leaving the ninety–nine “in the wilderness” while he searches for the lost. “And when he has found it, he lays it on his shoulders, rejoicing” — Luke emphasises the joy of finding the lost sheep. The shepherd has to carry the lost sheep because when a sheep is lost it lies down and refuses to move. “And when he comes home, he calls together his friends and his neighbours, saying to them, ‘Rejoice with me, for I have found my sheep which was lost’” — “Rejoice”. The lost sheep and the coin are not worth much compared to the ninety–nine or the nine. Yet, when found both the shepherd and the woman rejoice: Nothing and no one is insignificant to God. The refrain of joy and merrymaking is repeated eight times: verses 6, 7, 9, 10; 23, 24; 29, 32. “Just so, I tell you, there will be more joy in heaven over one sinner who repents than over ninety–nine righteous persons who need no repentance” — Jesus described the purpose of his mission as “I have not come to call the righteous, but sinners to repentance.” (Lk. 5: 32). Jesus is letting the Pharisees know that their attitude of self–righteousness is not the proper attitude. “Or what woman” — The question is addressed to the Pharisees (verse 4). Luke frequently adds the example of a female to that of a male (Lk. 1: 6–7; 2: 36–38; 4: 25, 38; 7: 11–15, 36–50; 8: 1–3, 19–21, 43–56; 10: 38–42; 11: 27; 13: 10–17). “having ten silver coins” — This silver coin was a “drachma”, of about the same value as a denarius, approximately a day’s wage for an agricultural worker. “if she loses one coin, does not light a lamp” — The woman had to light a lamp because there were no proper windows in the houses of the poor. “and sweep the house and seek diligently until she finds it? And when she has found it, she calls together her friends and neighbours, saying, ‘Rejoice with me, for I have found the coin which I had lost.’ Just so, I tell you, there is joy before the angels of God over one sinner who repents.” — This parable is almost word–identical with the parable of the lost sheep. “before the angels of God” — Verse 7 spoke of “in heaven”. And he said, “There was a man who had two sons” — The father is the central character in this parable. “and the younger of them said to his father, ‘Father, give me the share of property that falls to me.’” — The Law laid down the portion of a father’s property that would be given to each of the sons — the elder got two–thirds, the younger one–third. The younger son is quite bold in asking for his share now, before his father’s death. “And he divided his living between them. Not many days later, the younger son gathered all he had and took his journey into a far country, and there he squandered his property in loose living” — The “loose living” could also be described as ‘reckless extravagance’ by which he became impoverished. “And when he had spent everything, a great famine arose in that country, and he began to be in want” — When he had nothing left the “great famine” meant that any friends or acquaintances he might have had could not help him as they too were in dire straits. “So he went and joined himself to one of the citizens of that country, who sent him into his fields to feed swine” — Because pigs were the animals most used in Greek and Roman sacrifices, Jews regarded these animals as symbolizing paganism and to have anything to do with them was tantamount to apostasy from Judaism. The younger son had lowered himself into one of the most reprehensible occupations a Jew could undertake. “And he would gladly have fed on the pods that the swine ate” — He did not eat the pods, probably because the food of pigs disgusted him. “and no one gave him anything” — Pigs were of more value and importance than the younger son; they had priority in food even over people. The implication is that he stole his food, another sin. “‘How many of my father’s hired servants have bread enough and to spare, but I perish here with hunger!” — He remembers his father’s goodness and generosity to his servants and slaves. Memory of former goodness plays an important part in conversion and repentance. “I will arise and go to my father” — The son makes a firm resolution to go to his father and confess his faults. “treat me as one of your hired servants.” — Because he is not worthy on account of his behaviour, the son plans to request not to be treated as a member of the family with family privileges such as equal status and inheritance but as a servant with a wage and without the guarantee of permanence. This is his expression of repentance. “And he arose and came to his father” — He put his resolve into action; he did not postpone indefinitely. Note the three stages in conversion and repentance: (i) admittance of sin; (ii) sorrow at not being God’s son; (iii) acceptance of a suitable penance to show the sincerity of his contrition. “But while he was yet at a distance, his father saw him and had compassion” — His father was constantly on the watch for the return of his son, obviously even before the boy decided to return. He really loved him and missed him and patiently hoped for his homecoming. The father’s compassion included the forgiveness of losing all the inheritance he had given to the son who had squandered it and also the fact that he had associated with gentiles by feeding swine. The father’s love overlooked the sins of the young man. “and ran and embraced him and kissed him” — The father was in no way indifferent to the son’s return. He did not remain at a distance until the son came and humbled himself. He did not saunter or walk to meet him. He “ran” to meet him. For a Jewish father to run, embrace and kiss his grown son in public was most unbecoming. But it does show God’s eagerness to greet repentant sinners. “And the son said to him, ‘Father’” — Even though he was about to request to be treated as a servant, he uses the word “Father”; he is still his son, unlike the elder brother’s attitude as we will note. “I have sinned against heaven and before you; I am no longer worthy to be called your son’” — The son mentions the sin against God before his sin regarding his father. The father ignores these words and interrupts his son, not allowing him to say anything else he had intended to say. It is as if he was saying, ‘do not be stupid now and say that you are not worthy to be my son; of course, you are”. Note that he did not reproach him for his past. In this way the father showed how overjoyed he was and how he loved his son. “But the father said to his servants, ‘Bring quickly the best robe, and put it on him; and put a ring on his hand, and shoes on his feet; and bring the fatted calf and kill it, and let us eat and make merry” — “the best robe” would be a ceremonial robe, probably the father’s own; the signet ring would be the sign of authority and the shoes or sandals would be for the feet of members of the family; servants and slaves went barefoot. All three were signs of special status and freedom of those who were not slaves or servants (Gn. 41: 42; Esther 3: 10; I Mac 6: 15). The son is fully restored to the family status. Could it be that the son had no footwear, having been a servant to a Gentile? This is a thought. The Father: This Sunday Gospel is the best known and most loved of all the parables. 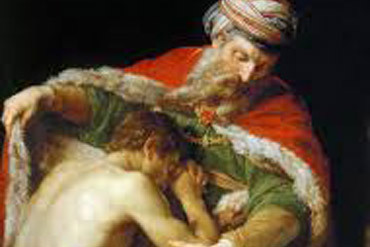 The parable of the father and two sons is most frequently called “The Prodigal Son”. He occupies verses 11 to 24. He has no active part to play in the second part, verses 25 to 32, which deal with the elder brother. The central figure is the father who dominates the entire parable. He is entirely wrapped up in his family of two sons and he loves both passionately. Both sons share the sin of selfishness and each lives for himself. Neither shows any great personal love for the father. Both are prepared to use him. What are the characteristics of “the father”? He loves each son deeply and cannot do enough for both. We can say that he lives for both and does not show more preference for one over the other. He desires nothing more than to have each live with him and be a united family. Unfortunately that is not how both sons perceive their relationship with the father. While they admit that they are sons they regard themselves as servants, indeed slaves. The younger returns home to be a slave; the elder regards his years of living at home as no better than slavery. The father does not reprimand or find fault with either son on returning home. He welcomes both and treats each with tenderness. When one has left him the father never gives up hope of his return but waits patiently. When both come home he celebrates lavishly because he is so overjoyed. It is worth recalling that we can be God’s children only when we have his characteristics. From this parable we learn that like our Father we must love God’s children including the sinners and those who have separated themselves from him. Like our Father we must keep seeking for the return and give an outstanding welcome when that happens. “We must celebrate and rejoice”. The Bible says that sin is universal; everybody sins. Indeed, “he who says he has no sin is a liar”. We all know this. But like the older brother, some do not admit it. He was too self–righteous to acknowledge the truth. He refused to own up to the several sins recorded about him. He refused to be one with his father. A big difference between the younger and elder sons was that the younger made a firm resolution, “I will arise and go to my father”. The elder man refused to go with his father. Lent is a time for reconciliation with God. How many are like the younger or elder son? Perhaps a better way of looking at my condition is to judge how honest I am with God — really sincere and truthful about my relationship, or fooling myself, like the elder brother?